Everyone enjoys a smooth ride on the highway. And you always notice when your vehicle isn’t driving as well as it should. 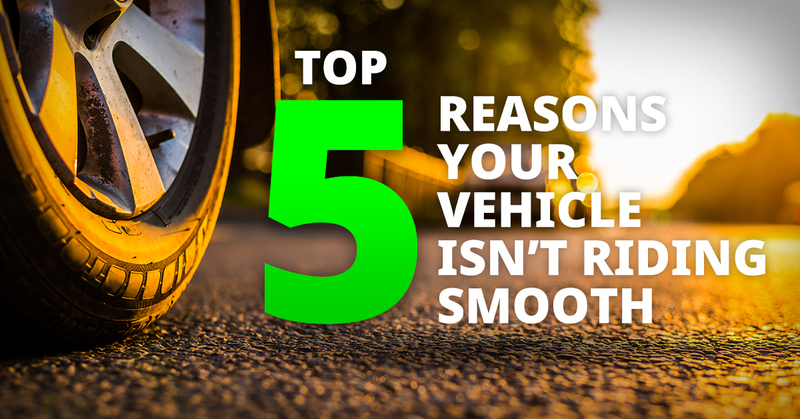 There are plenty of reasons why your vehicle’s ride could be rough or bumpy. Diagnosing why you’re having a rough ride can be difficult. We put together this list of helpful tips to set you on your way to getting the smooth ride you deserve. A vehicle’s tires are one of the most important parts. It’s the only part that comes in contact with the road. And tires impact more than just your ride quality, they also affect your gas mileage. Always make sure your tires are properly inflated. Keep a pressure gauge in your glovebox and regularly check the pressure. If it’s too high, let some air out, if too low, fill it up. Most vehicles have the tire pressure on one of the front door panels and in the vehicle’s owner’s manual. Regardless of the tire pressure from the vehicle manufacturer, do not exceed the pressure limits written on the sidewall of the tire. If a tire is getting low on tread, it may be time to replace the tires. To check a tire’s tread, insert a penny into the groove with Lincoln’s head facing you and upside down, if you can see all of Abe’s head, then you need new tires. Taking good care of your tires can save you a lot of time and money, find out more about the selection of tires at Action Gator Tire and how their auto experts can help you. If you answered “yes” to any of these items, you might need to replace your suspension. Check out the inventory of shocks and struts and other auto repair services available at Action Gator Tire to get yours fixed today. Brakes can be a major reason for a bumpy ride. Unsurprisingly, this often most noticeable while braking, especially at high speeds. If your vehicle shudders while braking you may have a warped rotor or damaged discs. Since these components are critical to stopping, its advised to perform much-needed auto repair as soon as possible. To see if a vehicle’s transmission is the source of the bumpy ride, pay close attention to how your vehicle feels while the transmission is shifting gears. If you feel the vehicle lurching or shaking while the vehicle is shifting, you may have a faulty transmission. This is a problem that could quickly become an expensive headache if you don’t deal with it promptly. That’s why it’s important to have it checked out the moment you notice a potential problem. If you notice a squeal or groan while your turning or happen to notice a clunking or rattling near your suspension there’s a good chance you might have a bad bearing. If you think this might be the case, then you should take your vehicle to the closest auto shop to have it looked at. You don’t have to deal with a bumpy ride. If you’re experiencing problems, bring your vehicle into the auto pros at Action Gator Tire. Our team of friendly auto experts is here to help you get the most of your car and enjoy a smooth ride all the way home.